Tokyo (AFP) - Japan's ancient sport of sumo suffered another humiliating blow Wednesday when grand champion Harumafuji retired to atone for a brutal assault on a rival wrestler while out drinking. The Mongolian "yokozuna", sumo's highest rank, fought back tears as he apologised for the embarrassment caused by a violent outburst last month that left countryman Takanoiwa with a fractured skull. 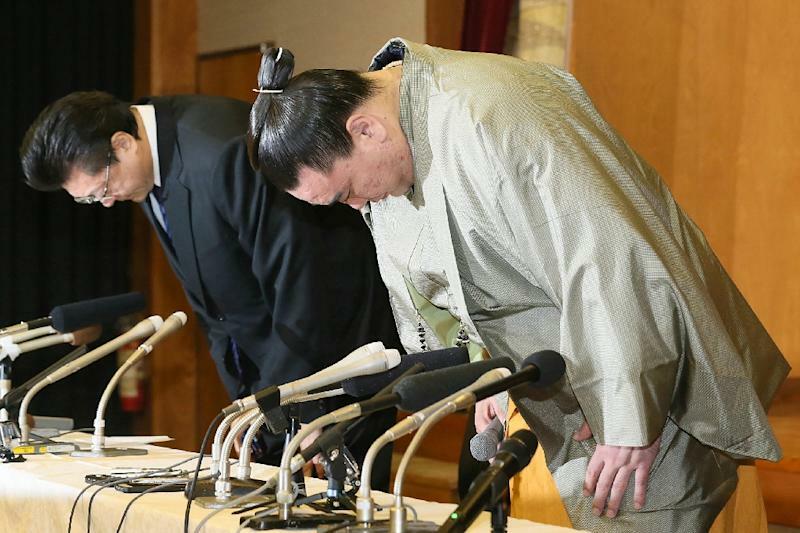 "My conduct was not befitting of a yokozuna," Harumafuji told a news conference in Fukuoka, before bowing deeply to express his contrition. "I take full responsibility for injuring Takanoiwa. I'm deeply sorry for the trouble I've caused." Japanese Prime Minister Shinzo Abe weighed in on the debate, while news of Harumafuji's demise even nudged North Korea's latest missile launch off top spot on many Wednesday morning news programmes. His stable-master Isegahama sobbed as he revealed that Harumafuji had offered his resignation over the incident. "I've watched him grow since he was 16 and have never seen or heard of him being violent before," said Isegahama, dabbing his eyes with a handkerchief. "I can't imagine why it happened." Harumafuji's exit mirrors that of another Mongolian star, Asashoryu, who stepped down in 2010 after being accused of breaking a man's nose in a drunken brawl outside a Tokyo nightclub. 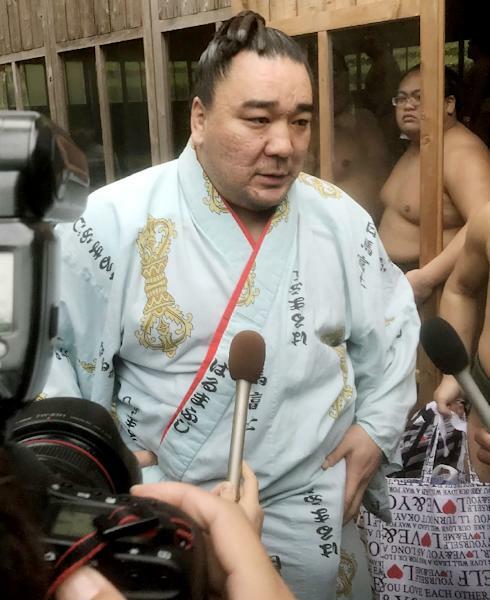 Yokozuna are expected to be beyond moral reproach but the writing was on the wall for Harumafuji after he confessed to hitting Takanoiwa for texting his girlfriend while he was scolding him over his poor attitude. The 33-year-old Harumafuji, who reached sumo's hallowed rank five years ago and whose real name is Davaanyam Byambadorj, denied reports he had used a beer bottle in the attack but admitted punching Takanoiwa and bashing him with a karaoke remote control. Takanoiwa, 27, was hospitalised after suffering concussion and a fractured skull base in the fight, which broke out at a bar in the western Japanese city of Tottori in late October, according to local media. His stable-master subsequently reported the incident to the police, who invited Harumafuji in for questioning. "I felt it was my duty to correct a lack of manners and civility," said the disgraced yokozuna, partly explaining his rage that night. "But I injured Takanoiwa and his heart is probably hurting too. It wasn't because of the alcohol. I've never lost my temper or hurt someone after drinking before." Prime Minister Abe, who was busy dealing with Pyongyang's missile test, expressed disappointment over sumo's latest scandal during a scheduled parliament session. "This incident of violence in the world of sumo, while still under investigation by the Japan Sumo Association, is extremely regrettable," he told the upper house. "It is important to clarify the facts, then the sports ministry will take appropriate measures." The furore has reopened old wounds in the closeted world of sumo after an increase in violence, allegations of illegal betting, links with crime syndicates and drug busts shook the roly-poly sport in recent years. A sumo stable-master was sentenced to six years in prison in 2007 after a trainee wrestler was beaten to death, triggering outrage across Japan. Another gym boss escaped criminal punishment after whacking three wrestlers with a golf club for breaking curfew. The 135-kilo Harumafuji, whose nifty technique makes up for his relative lack of size, won nine Emperor's Cups before his fall from grace. 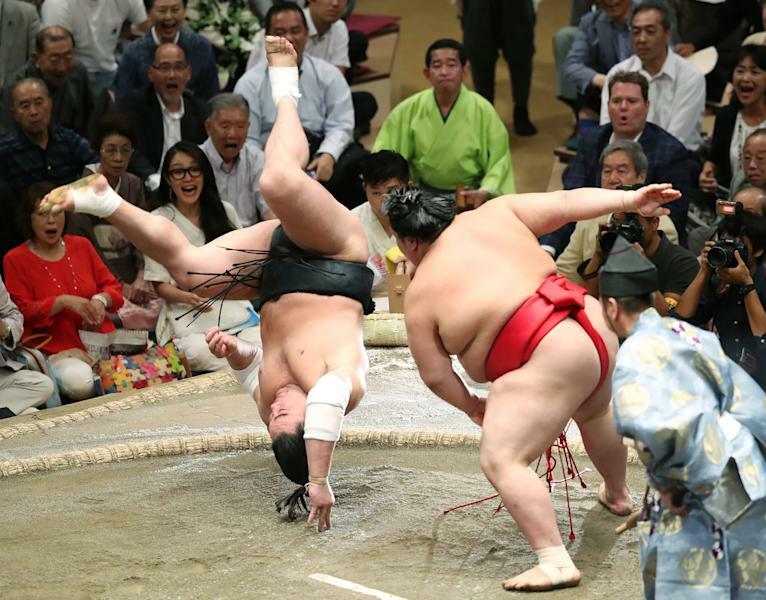 Historians claim sumo dates back more than 2,000 years and the sport retains many Shinto religious overtones. Breaches of its strict protocol are not tolerated, but the trailblazing Asashoryu stretched the patience of officials to breaking point with his antics, despite roaring to 25 major championships. He was ordered to clean up his act after a sparking a soapy punch-up with a rival wrestler during a soak in a communal bath. Asashoryu was subsequently banned for forging a doctor's note for an apparent back injury before being caught playing in a charity football match wearing a Wayne Rooney shirt.